With an exhibit area of more than 150,000 m2 and over 2,000 exhibitors from over 100 countries, it is among the largest trade exhibitions in the offshore and marine sector. 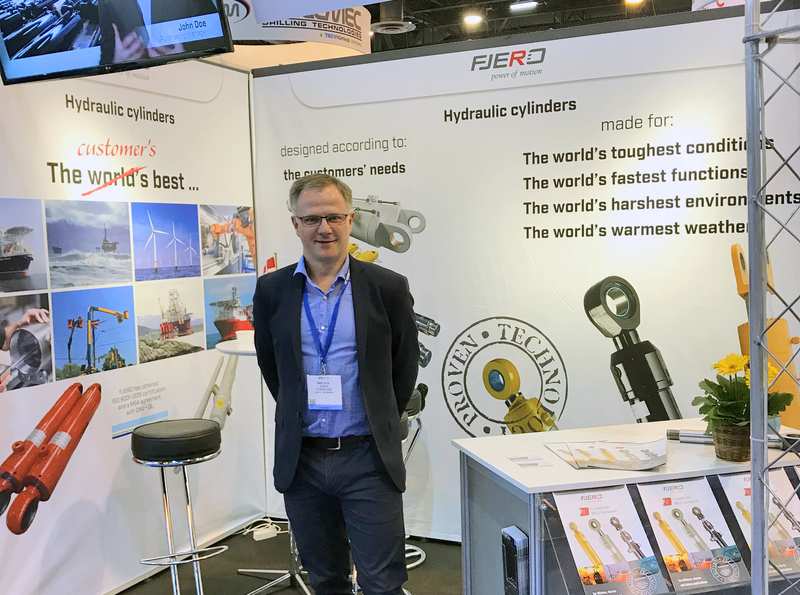 As a supplier of customer-tailored hydraulic cylinders to the industry, Fjero’s participation in the exhibition is self-evident. Fjero’s expertise is perfectly suited to the offshore and marine sector, which makes special demands of durability and function. Downtime is a big concern, as untimely interruptions in operations can be quite costly. Because offshore equipment is subjected daily to tremendous strain in extremely harsh environments, companies make high demands on suppliers of components to their large installations. Fjero uses the experience and know-how it has acquired over decades to design and develop the perfect hydraulic cylinder solutions. “We are participating in the exhibition in order to attend to our many loyal customers as well as to create new contacts. The offshore and marine sector is constantly changing. This makes great demands on equipment and new equipment functions. And we want to be at the forefront, applying our extensive know-how to develop and manufacture customer-specific solutions,” says Sales Manager Niels Storgaard Jensen, who will be present at Fjero’s stand. The Offshore Technology Conference (OTC) gives Fjero an opportunity to stay up-to-date on the development of new products and to gather general branch knowledge and know-how. Knowledge and insight are needed to stay ahead as a competent supplier of hydraulic cylinders. We also successfully use our experience and knowledge from these sectors in other industries that require customer-tailored hydraulic cylinders. OTC 2019 is open to visitors from 6 to 9 May 2019. For further information, contact Sales Manager Niels Storgaard Jensen, Fjero A/S on +45 9616 0000.